Probably the last chance to see Aretha Franklin in Toronto before her retirement later this year. 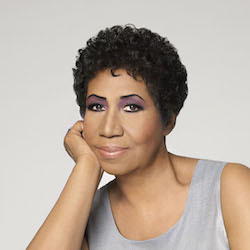 The Legendary Queen of Soul Aretha Franklin to Headline TD Toronto Jazz Festival This Summer! TORONTO – The legendary Queen of Soul, Aretha Franklin brings her extraordinary voice to the TD Toronto Jazz Festival, performing onSaturday, July 1 at the Sony Centre for the Performing Arts. Tickets go on sale Wednesday, April 5 at all Ticketmaster outlets and the Sony Centre Box Office. One of music’s greatest treasures, Aretha Franklin has inspired a generation of vocalists, paving the way for all other artists who followed – from Whitney Houston to Beyonce, Alicia Keys to Adele. Labelled the “greatest singer of all time” by Rolling Stone, Aretha has solidified her place in the popular and soul music pantheon. There is simply no one better.For more than 60 years, Aretha has been a powerhouse vocalist rightfully claiming her place in music history. As the Queen of Soul, the passion and intensity of her music has never failed to move listeners. From soul and gospel beginnings to the Civil Rights movement to American pop music as a whole, Franklin’s illustrious and storied career has been unchallenged thus far – 18 Grammy’s; the first woman inducted into the Rock and Roll Hall of Fame; and a Presidential Medal of Freedom honoree, the United States highest civilian honour. All of this justifiably earning Franklin Rolling Stone’s #1 spot on its list of The Greatest Singers of All Time. Now that calls for a little respect. In addition to supergroup Hudson, featuring Jack DeJohnette, Larry Grenadier, John Medeski and John Scofield, Mavis Staples, Hiromifeaturing Edmar Castaneda, and Gregory Porter in a special preview concert, round out the four-night series at Koerner Hall. Featuring an all-star cast of the most premiere jazz musicians, the TD Toronto Jazz Festival is excited to be back at Koerner Hall at the Telus Centre for Performance and Learning. Caravan Palace, a self-described electro-swing group from Paris, brings the feel-good vibes to The Phoenix Concert Hall on Monday, June 26. Think Django Reinhardt meets Cab Calloway meets Daft Punk. A steampunk fusion of ’30s jazz-swing and electro-gypsy dance, the eccentric sextet kicks off the party instantly wherever they go. Spend an evening with the finest in jazz, as the Jazz Bistro plays host to the Festival with a lineup that includes piano powerhouse couple Bill Charlap and Renee Rosnes (both in duo and trio settings), NEA Jazz Master Sheila Jordan, heavyweight Guido Basso, vocalists Carol Sloane and Carol Welsman, and Infinitude, an exciting new project from Canadian sisters Christine and Ingrid Jensen featuring Ben Monder. Showcasing a line-up of some of Canada’s best-loved jazz luminaries, the Home Smith Bar at the Old Mill Toronto presents another spectacular four-night ‘Festival Within The Festival,’ hosted by JUNO nominated vocalist Heather Bambrick and the all-star Russ Little Quartet. It’s a new show nightly featuring a stellar roster of guest stars – June Garber, Shakura S’Aida, Amanda Martinez and Micah Barnes. The TD Toronto Jazz Festival will be making another major performance announcement in the coming weeks. The complete lineup of the TD Toronto Jazz Festival, running from June 23 – July 2, will be announced in April 2017. Gregory Porter – Koerner Hall at Telus Centre | 8 p.m.
Renee Rosnes Trio – Jazz Bistro | 7 p.m. | 10 p.m.
Bill Charlap / Renee Rosnes Duo – Jazz Bistro | 7 p.m. | 10 p.m.
Heather Bambrick & Friends with the Russ Little Quartet feat June Garber – Home Smith Bar at The Old Mill | 7:30 p.m.
Bill Charlap & Carol Sloane – Jazz Bistro | 7 p.m. | 10 p.m.
Heather Bambrick & Friends with the Russ Little Quartet feat Shakura S’Aida – Home Smith Bar at The Old Mill | 7:30 p.m.
Joss Stone – Danforth Music Hall | 9 p.m.
Sheila Jordan Quartet – Jazz Bistro | 7 p.m. | 10 p.m.
Mavis Staples – Koerner Hall at Telus Centre | 8 p.m.
Sheila Jordan Quartet – Jazz Bistro | 7 pm. | 10 p.m.
Hiromi Duet: Featuring Edmar Castaneda – Koerner Hall at Telus Centre | 8 p.m.
Guido Basso Quintet – Jazz Bistro | 7 p.m. | 10 p.m.
Hudson: Jack DeJohnette, Larry Grenadier, John Medeski, John Scofield – Koerner Hall at Telus Centre | 8 p.m.
Ingrid and Christine Jensen with Ben Monder: Infinitude – Jazz Bistro | 7 p.m. | 10 p.m.
Carol Welsman Trio – Jazz Bistro | 7 p.m. | 10 p.m.
Heather Bambrick & Friends with the Russ Little Quartet feat Amanda Martinez – Home Smith Bar at the Old Mill | 7:30 p.m.
Aretha Franklin – Sony Centre | 8 p.m.
Heather Bambrick & Friends with the Russ Little Quartet feat Micah Barnes – Home Smith Bar at the Old Mill | 7:30 p.m.
One of the premiere jazz festivals in North America, the TD Toronto Jazz Festival celebrates its 31st edition when it runs from June 23 – July 2, 2017. With more than 1,500 musicians performing, the Festival has something for every music lover. From emerging artists to established musicians, jazz legends to undiscovered gems, the TD Toronto Jazz Festival showcases the very best in jazz this summer! The TD Toronto Jazz Festival will be making another major performance announcement in the coming weeks. The complete lineup of the 2017 TD Toronto Jazz Festival will be announced April 2017. Posted in English blog and tagged as 2017, Aretha Franklin, featured, jazz, Jazz Bistro, koerner hall, Toronto, Toronto Jazz Festival.